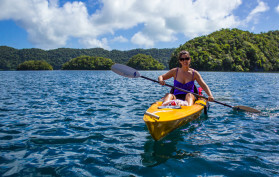 Kayaking through Palau’s Rock Islands by default feels like being a castaway in an undiscovered paradise. This was my second time to take this day trip and it was no less exhilarating than nearly two years ago. Palau is really a magical place. 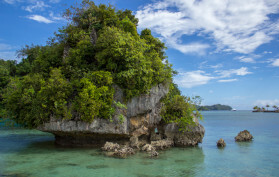 Once the setting for a season of Survivor, this tiny Micronesian island chain is home to a gazillion kinds of coral, sea life, and breathtaking rock islands. This was my second visit and working vacation. Read my full travel story. 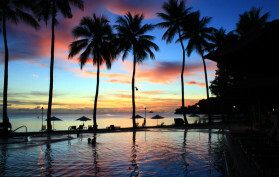 A day trip with Sam’s Tours (samtours.com) is an alternately thrilling and relaxing water adventure. Rise early to depart on a speedboat, whizzing through the majestic Rock Islands with their plumes of grass sprouting from limestone mushroom heads. Stop to snorkel and you may catch a glimpse of an elusive sea turtle or a family of black-tipped sharks, two- to three-feet long and as curiously cautious as you. 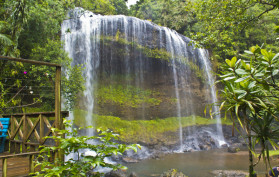 Babeldaob is Palau’s largest island — about three-quarters the size of Guam and Fish ‘n Fins (fishnfins.com) offers the only off-road eco tour of the island. 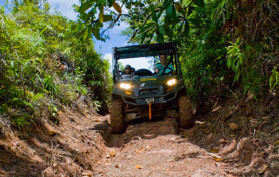 Rise early for a wild ride off-road in a military-usage Polaris, which is a great way to see the island. 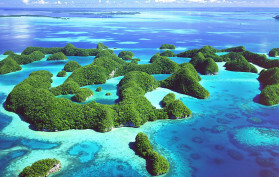 Palau is a destination like no other in Micronesia. The chain of islands is small and remote, but developed for comfortable, western style tourism. Palauans are strict guardians of the island’s pristine and delicate terrestrial and aquatic ecology. What has coalesced at 07°20 north of the Equator is nothing short of phenomenal. Locals are quick to boast about the island’s ecological charms, often rhapsodizing about its unique beauty.